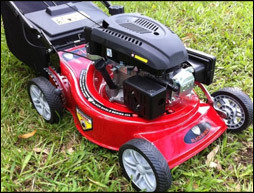 Lawn Mower Buying Guide in Australia | Petrol Battery Or electric? A lawn mower is one of the more important and expensive purchases for your garden. If you have a large lawn or are a gardener or handyman you need to choose a lawnmower which is quick, efficient and above all safe. There are plenty of makes and models out there on the market so it can be tough deciding which is the best purchase for you. Below are our top tips for choosing a lawn mower which will perform and last. A self propelled lawnmower is a must for most people. In simple terms, a self propelled lawn mower is started by pressing down on a lever or bar on the mower. This gives you great control when cutting, a number of cutting positions and it’s the ultimate in safety. Once you let go of the bar or lever for any amount of time the blades stop spinning. The Australian weather can be harsh and varied. From cold wet weather to hot dry, dusty days. You need to look for a lawn mover which is heavy duty and lasts being stored out in garages, sheds or carted about on the back of a Ute going from job to job. The larger the capacity the less times you have to empty the mulch. If you are a gardener or handyman or have a large lawn area a large capacity is a must. Look for a mower with a 60L or larger capacity for larger areas and fewer stops to empty grass and mulch. The size of the engine will dictate how powerful your lawn mover is and how quickly you can get the job done. The most powerful engine is a 4-stroke although a 2 stroke engine is great for your average Australian garden. 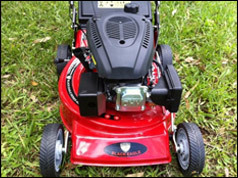 Look for a lawnmower that is easy to maintain and change the replaceable parts such as oil, filters and blades. Hopefully, these tips will help you make the right choice in purchasing a great lawnmower. Look online where you can access some great brand names at heavily discounted prices. Site Contents © 2019 Bargains Online | All rights reserved.